So the new year doesn’t mean a new you, and you can’t bear the thought of a dry January? Well, fear not, because you’re in good company with us as we’ve compiled a list of all the best menus (wine pairings and all) to get you through the toughest months of the year. Here are 10 special menus and dining events not to miss in January and February. Chef Michel Troisgros and his son Léo Troisgros. Celebrated French Chef Michel Troisgros (of the Troisgros family, one of France’s most famous culinary legacies) and his son Léo are set to make their first Hong Kong appearance as guest chefs at Épure. Joined by Michele Abbatemarco, pastry chef at Troisgros in Tokyo, the three-night-only tasting menu will feature some prized ingredients such as Petrossian Beluga caviar, French winter black truffles, crayfish, scallops and more, so that guests can get a taste of the Troisgros legacy across two generations. Partridge dish from the Furs & Feathers menu. Newly awarded two-Michelin-star restaurant Écriture is kicking off the season with a special menu focusing on hunted game from around the world. The Furs & Feathers menu by Executive Chef Maxime Gilbert will be available for a limited time only and offers the season’s finest and rarest wild game including creative dishes with grouse, partridge, doe, teal wild duck and hare; guests can opt for four or seven courses. Surf and Turf: Beef fillet and blue lobster with Perigueux sauce. It’s black winter truffle season and executive chef of Rech, Stéphane Gortina, knows just want to do with it: She’ created a 5-course menu highlighting this decadent ingredient. Matched with some other exceptional produce such as French blue lobster and Australian beef fillet, as well as Scottish scallops with salsify-chestnut-truffle, the dishes will also be served with an additional fifteen grams of black truffle. For the first four-hand collaboration at Michelin-starred VEA this year, Julien Royer, chef-owner of two-Michelin-starred modern French restaurant Odette in Singapore, joins chef Vicky Cheng in the kitchen. For two nights only, guests will be able to sample dishes including chef Royer’s uni ‘French toast’; XXL langoustine with topinambour, bergamot, seaweed; and chef Cheng’s Waygu beef char siu to name a few. (Left to right) Chef Dylan Jones, chef Jarrett Wrisley and chef Charrin Singdaechakarn. There’s nothing quite like a hot bowl of curry or soup in the winter. Soul Food Thai is giving us just that, in the form of a two-night collaborative dinner with chef Dylan Jones, one half of the duo behind Michelin-starred Bo.Lan in Bangkok, Soul Food’s founder/chef Jarrett Wrisley and Soul Food Thai’s own chef Charrin Singdaechakarn. Highlights from the menu include a hearty grilled red coconut curry with wild fish and a belly-warming hot and sour southern Thai oxtail soup. One of the new dishes at Uma Nota: grilled black cod skewers. Brazilian-Japanese restaurant Uma Nota are celebrating Mutsuki — the month of harmony — where families gather to celebrate in January for a New Year’s meal and share dishes that are said to bring good luck and health. In honour of this tradition, an eight-course Japanese dinner, with Brazilian twists throughout, will be available for one night only. Two new dishes have also been created and includes ribeye with yakiniku sauce and grilled black cod skewers with saikyo miso and ginger. American chef and restaurateur Anita Lo. As the first female guest chef to cook a State Dinner at the White House, Anita Lo has come to Hong Kong to take over the kitchen at Ho Lee Fook for an exclusive one-night dinner. She will be bringing her passion for multicultural flavours and recipes to the five-course meal which will feature some of Lo’s signatures such as foie gras soup dumplings and hairy crab with Hokkaido uni and black winter truffle chawanmushi. (Left to right) Chef Noël Berard and chef Nicholas Chew. A collaboration between Scotch whisky brand Johnnie Walker Blue Label and Hong Kong restaurant group Le Comptoir invites whisky lovers to a private dinner at Test Kitchen in Sai Ying Pun. The experience offers remarkable whiskies from the four corners of Scotland, including an incredibly rare 1975 Cambus single-cask expression. This will be paired with a four-course menu curated by chef Nicholas Chew from Bibo and chef Noël Berard from Écriture. This special gastronomic experience is by private invitation or exclusively through Le Comptoir. Reservations are available for lunch & dinner sessions on Saturday 23 and Sunday 24 February 2019, priced at HK$1,820 per person (includes personalized gift of an engraved bottle of Johnnie Walker Blue Label, 75cl). Bookings can be made here: bit.ly/LCxJWBlue. Steamed xiaolong bao with chrysanthemum flower. Just our cup of tea, Dim Sum Library has launched a new menu featuring dishes, desserts and cocktails infused with the finest handpicked leaves. 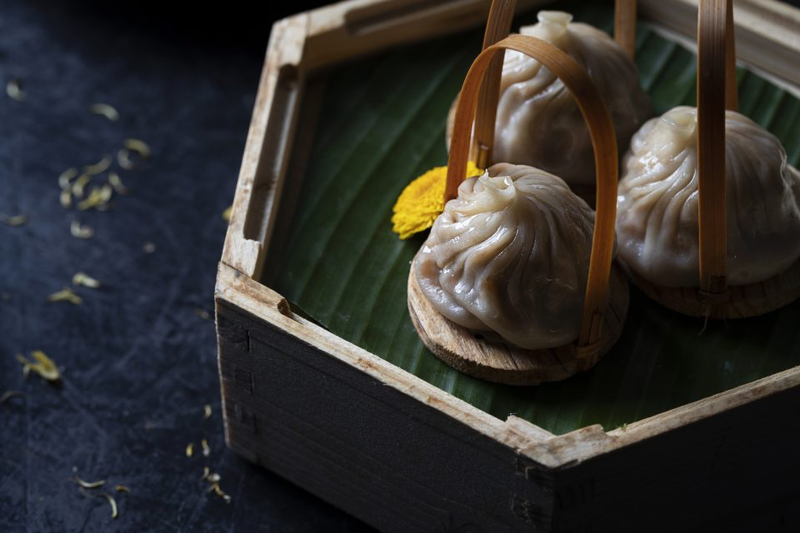 Tea time can start with the steamed xiaolongbao with chrysanthemum; the baked rose-scented sea bass, which has been marinated with rose petals and jasmine tea, resulting in blushing pink fish; followed by a chocolate milk tea bao. Nikkei-inspired hotspot TokyoLima’s newest menu is a collection of ‘Memories’ and dishes that reflect Executive Chef Arturo Melendez’s experiences and travels through South America and Asia. The new dishes include small plates such as Hotate maki with seared Hokkaido scallops, Parmesan cheese, avocado, kiuri-infused lime butter and the chef’s secret sauce. There are also larger sharing plates which include Salmon & Glaze, complemented by a zesty yellow chilli, miso and red pepper purée.